A lot can happen in a few days, just ask anyone who attends or exhibits at trade shows. From the moment the exhibit hall opens, there is a sense of excitement and excellence that fills the air. Exhibit booths are unpacked and setup with precision while sales teams network at full-force and deliver expertly crafted presentations. Signs are carefully hung and tables are lined with the best materials and giveaways their organizations have to offer. But after a few jam-packed days of product demos, sales pitches, and one too many networking reception cocktails, the excitement fades and exhaustion sets in. As exhibiting hours wind down, the race to get to the airport begins. In the process, your organization’s trade show booth and marketing materials may take a beating. Booth graphics get scratched, light kits break, and table cloths end up a wrinkled mess. Beyond the booth damage, piles of literature and expensive brochures get tossed in the recycle bin. And those cool giveaways? If they weren’t selected with attendee travel in mind those branded promotional products will become gifts for the hotel and conference center staff. Sound familiar? To add insult to injury, onsite staff may not report booth issues or damage to event marketing teams. So when the next trade show rolls around, marketing may be scrambling to replace or reprint items. Or worse, employees may discover the booth is broken when they’re setting up at the next show. So how can trade show managers and marketing teams prevent this from happening? How can they ensure their trade show booth remains in working order and that everything arrives at the show safely and on-time? Preparing for a trade show is hard work. The last thing marketing and event teams need to worry about is digging products out of office storage closets and preparing complicated shipments. Instead, they can save valuable time by moving trade show materials to a fulfillment center that offers web-to-print software. Doing so means your trade show materials will be stored, cared for, and shipped by a team of specialists so you can focus on event strategy instead of logistics. When it’s time to get materials to the next trade show, all you’ll have to do is place an online order. 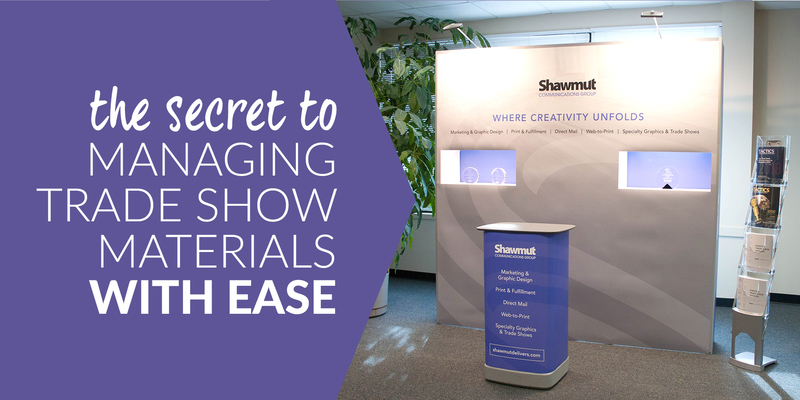 In just a few clicks you’ll be able to ship your trade show booth—and any accompanying materials—directly to the event site. Expensive exhibit booths and displays should be properly maintained. If you’ve attended a few trade shows, you know that the scene described above is all too real. Thankfully a web-to-print solution can mitigate some (if not most of) the damage and ensure that the booth arrives in excellent condition for the next event. Each time a booth, banner or other trade show display is shipped it is carefully packed to ensure safe arrival. 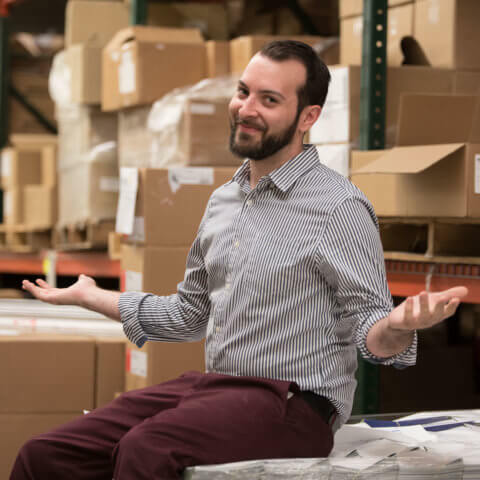 Fulfillment teams also plan out the return trip by providing necessary packing material, storage containers, and pre-printed return shipping labels. When the shipment arrives back at the warehouse it is well-inspected and any necessary repairs or replacements are planned. Once the booth is restored to working order, it is carefully re-packed and put back into inventory so it is available for the next online order. If your organization attends a lot of trade shows you may have certain products grouped by show-type, location, season, etc. With web-to-print, you can bundle any number of products into pre-assembled or custom kits. Using pre-assembled kits, marketing teams can designate everything someone will need for a particular trade show and package it as one online product.  Alternatively, users may have the ability to customize kits by adding or removing items before the order is placed, as in this example for athenahealth. In many cases, trade shows will have strict move-in schedules. If a shipment arrives too early—or worse, too late—you can incur additional fees or delays at setup time. 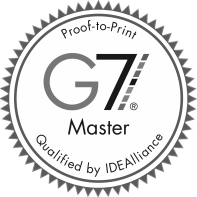 By placing your order through web-to-print software, you can specify the desired arrival date based on the trade show guidelines. From there, fulfillment specialists will identify the most cost-effective shipping method and optimal ship date to ensure everything arrives at the perfect time. With web-to-print software and inventory management services, every item will have its own unique ID. The unique ID is assigned at the item level (not the product) so if there is more than one of any given product, each item can be tracked separately. When products are ordered the unique ID is tied to that specific order. 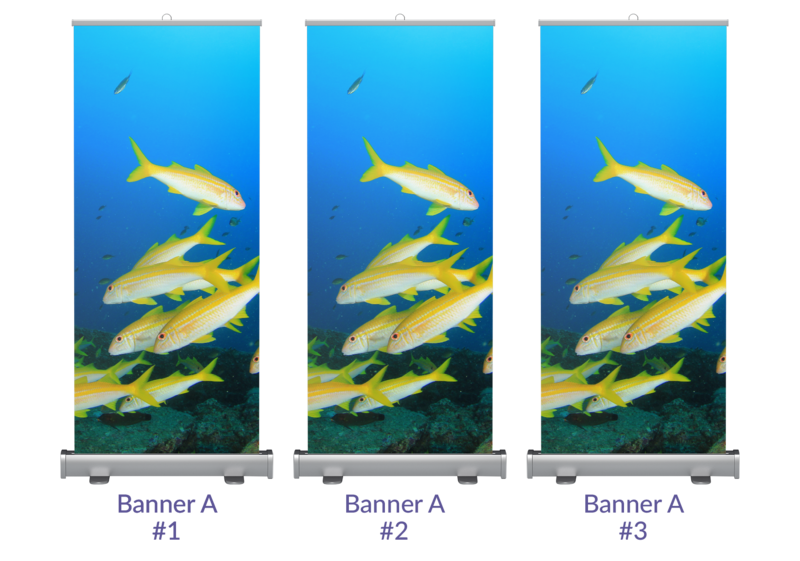 For example, let’s say your organization has three retractable banner stands with the same set of graphics (we’ll call it Banner A). The three banners would be stored in inventory as Banner A #1, Banner A #2, and Banner A #3, but only 1 product for Banner A will display online. When someone orders Banner A, the system would tie the order to Banner A #1 (or 2 or 3 depending on inventory availability), and fulfillment specialists would send that specific banner to the event location with a convenient return shipping label. After the event, Banner A #1 is sent back to the warehouse where it will be inspected for damage prior to being placed back in inventory. If any damage is found, the order report will indicate where it was sent and who placed the order. Although the order contact may not be the same person that packed the banner for the return trip, employees may take greater care of products when they know that usage is tracked. Online storefronts offer 24/7 access to real-time inventory. As you prepare for future events you can easily pull an inventory report to see if there’s anything you need to order or reprint. In addition, every product can have a minimum re-order point or notification that will alert you when inventory is low. 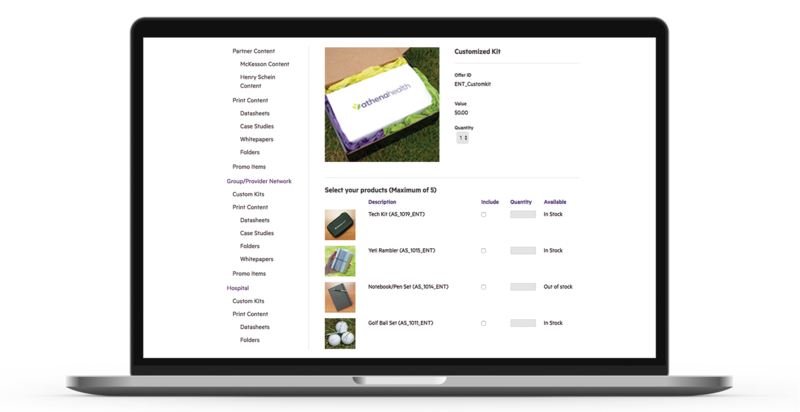 By keeping tabs on your inventory, you can avoid running out of products you’ll need for an event or paying extra for rush reprints and shipping. 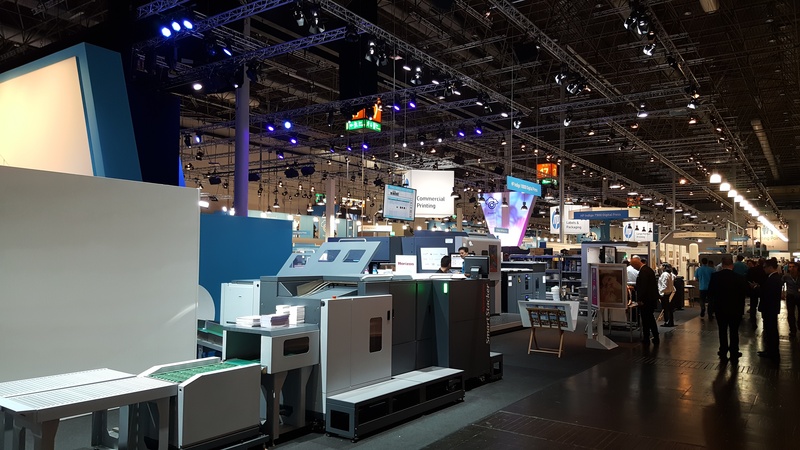 If you’re sick of replacing trade show booths year-after-year or dealing with a post-show mess, a web-to-print storefront might be a good solution. By making it easier to manage your trade show materials you’ll have more time to focus on what really matters and ensure your event is a success.